Pilgrimage to a holy site is a core principle of almost all faiths. 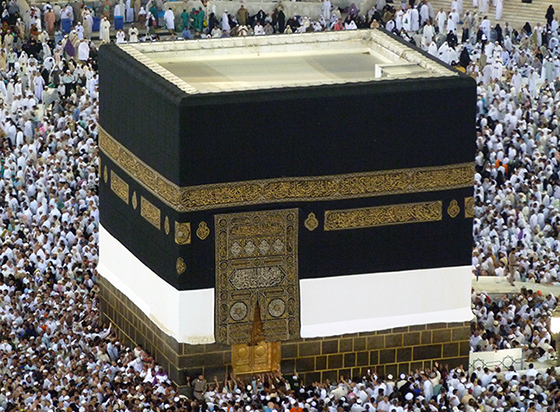 The Kaaba, meaning cube in Arabic, is a square building, elegantly draped in a silk and cotton veil. Located in Mecca, Saudi Arabia, it is the holiest shrine in Islam. In Islam, Muslims pray five times a day and after 624 C.E., these prayers were directed towards Mecca and the Kaaba rather than Jerusalem; this direction (or qibla in Arabic), is marked in all mosques and enables the faithful to know in what direction they should pray. The Qur‘an established the direction of prayer. All Muslims aspire to undertake the hajj, or the annual pilgrimage, to the Kaaba once in their life if they are able. Prayer five times a day and the hajj are two of the five pillars of Islam, the most fundamental principles of the faith. Upon arriving in Mecca, pilgrims gather in the courtyard of the Masjid al-Haram around the Kaaba. They then circumambulate (tawaf in Arabic) or walk around the Kaaba, during which they hope to kiss and touch the Black Stone (al-Hajar al-Aswad), embedded in the eastern corner of the Kaaba. The Kaaba was a sanctuary in pre-Islamic times. Muslims believe that Abraham (known as Ibrahim in the Islamic tradition), and his son, Ismail, constructed the Kaaba. Tradition holds that it was originally a simple unroofed rectangular structure. The Quraysh tribe, who ruled Mecca, rebuilt the pre-Islamic Kaaba in c. 608 C.E. with alternating courses of masonry and wood. A door was raised above ground level to protect the shrine from intruders and flood waters. Muhammad was driven out of Mecca in 620 C.E. to Yathrib, which is now known as Medina. Upon his return to Mecca in 629/30 C.E., the shrine became the focal point for Muslim worship and pilgrimage. The pre-Islamic Kaaba housed the Black Stone and statues of pagan gods. Muhammad reportedly cleansed the Kaaba of idols upon his victorious return to Mecca, returning the shrine to the monotheism of Ibrahim. The Black Stone is believed to have been given to Ibrahim by the angel Gabriel and is revered by Muslims. Muhammad made a final pilgrimage in 632 C.E., the year of his death, and thereby established the rites of pilgrimage. The Kaaba has been modified extensively throughout its history. The area around the Kaaba was expanded in order to accommodate the growing number of pilgrims by the second caliph, ‘Umar (ruled 634-44). The Caliph ‘Uthman (ruled 644-56) built the colonnades around the open plaza where the Kaaba stands and incorporated other important monuments into the sanctuary. During the civil war between the caliph Abd al-Malik and Ibn Zubayr who controlled Mecca, the Kaaba was set on fire in 683 C.E. Reportedly, the Black Stone broke into three pieces and Ibn Zubayr reassembled it with silver. He rebuilt the Kaaba in wood and stone, following Ibrahim’s original dimensions and also paved the space around the Kaaba. After regaining control of Mecca, Abd al-Malik restored the part of the building that Muhammad is thought to have designed. None of these renovations can be confirmed through study of the building or archaeological evidence; these changes are only outlined in later literary sources. Reportedly under the Umayyad caliph al-Walid (ruled 705-15), the mosque that encloses the Kaaba was decorated with mosaics like those of the Dome of the Rock and the Great Mosque of Damascus. By the seventh century, the Kaaba was covered with kiswa, a black cloth that is replaced annually during the hajj. Under the early Abbasid Caliphs (750-1250), the mosque around the Kaaba was expanded and modified several times. According to travel writers, such as the Ibn Jubayr, who saw the Kaaba in 1183, it retained the eighth century Abbasid form for several centuries. From 1269-1517, the Mamluks of Egypt controlled the Hijaz, the highlands in western Arabia where Mecca is located. Sultan Qaitbay (ruled 1468-96) built a madrasa (a religious school) against one side of the mosque. Under the Ottoman sultans, Süleyman I (ruled 1520-1566) and Selim II (ruled 1566-74), the complex was heavily renovated. In 1631, the Kaaba and the surrounding mosque were entirely rebuilt after floods had demolished them in the previous year. This mosque, which is what exists today, is composed of a large open space with colonnades on four sides and with seven minarets, the largest number of any mosque in the world. 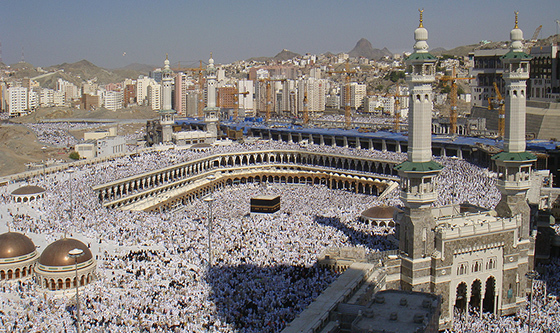 At the center of this large plaza sits the Kaaba, as well as many other holy buildings and monuments. The last major modifications were carried out in the 1950s by the government of Saudi Arabia to accommodate the increasingly large number of pilgrims who come on the hajj. Today the mosque covers almost forty acres. 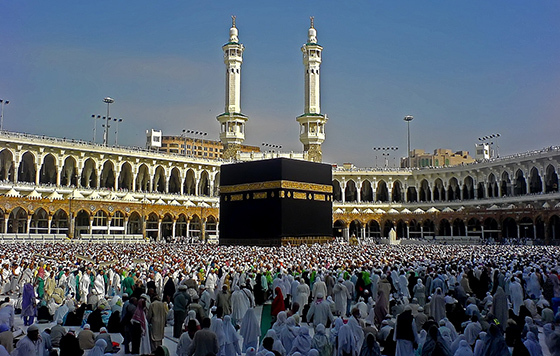 Today, the Kaaba is a cubical structure, unlike almost any other religious structure. It is fifteen meters tall and ten and a half meters on each side; its corners roughly align with the cardinal directions. The door of the Kaaba is now made of solid gold; it was added in 1982. The kiswa, a large cloth that covers the Kaaba, which used to be sent from Egypt with the hajj caravan, today is made in Saudi Arabia. Until the advent of modern transportation, all pilgrims undertook the often dangerous hajj, or pilgrimage, to Mecca in a large caravan across the desert, leaving from Damascus, Cairo, or other major cities in Arabia, Yemen or Iraq. The numerous changes to the Kaaba and its associated mosque serve as good reminder of how often buildings, even sacred ones, were renovated and remodeled either due to damage or to the changing needs of the community. Only Muslims may visit the holy cities of Mecca and Medina today. Jonathan Bloom and Sheila Blair, “Mecca” in The Grove encyclopedia of Islamic art and Architecture, Oxford University Press, 2009. K. A. C. Creswell, Early Muslim Architecture, Oxford University Press, 1932/revised and enlarged 1969. Cite this page as: Dr. Elizabeth Macaulay-Lewis, "The Kaaba," in Smarthistory, August 8, 2015, accessed April 19, 2019, https://smarthistory.org/the-kaaba/.